I got an email the other day from what appeared to be a non-profit organizationrequesting donations for their cause. Normally this would be fine, however I never signed up to receive their information, I’ve never heard of them and don’t know how they got my email address. On top of this there were no instructions nor mechanism to unsubscribe. They’re also asking for me to send them a check which enables them to care for people and their animals. Noble cause? Perhaps so, but not the right way to go about marketing. Icing on the cake? The email was written as if the dog pictured in the email wrote it. Miraculously I got what appeared to be an auto-generated email in my inbox. Shocked and awed, I opened it and to my dismay it was a request asking me to take another action to unsubscribe! Did I mistype that very word when I requested it in the first place? I don’t think so. Finally the next day I got the confirmation of the confirmation of the request to unsubscribe. Phew! Unsubscribes should be one click and web-based if possible. Most Email Service Providers provide this as part of the package. There should be a working reply-to so that if someone wanted to put the words “unsubscribe” or “remove in the subject line it will be automatically taken care of. There should be clear instructions for how they can unsubscribe. Your recipients should not have to input their email address into a field in order to unsubscribe, you already have their email address you should know who they are. 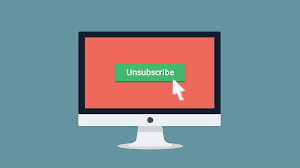 I know we all hate it when our recipients unsubscribe, but it doesn’t mean they won’t continue to do business with you in the future. It puts you on the side of being a good marketer and it protects your brand in the long run.